My research aims to obtain accurate estimations of respiration in the light under a range of ambient and experimental growing conditions for different plant species to better parameterize the terrestrial carbon cycle. Respiration provides energy and carbon skeletons for a large swathe of plant functions and processes. While this is mainly measured in the dark, respiration continues in the light, but is inhibited to varying degrees. Neglecting this inhibition can lead to overestimations of both gross primary productivity and net primary productivity at the leaf, organism, and ecosystem scales. Part of my current research at Havard Forest is measuring respiration in the light at multiple canopy heights in dominant forest trees through the growing season (May-Sept). I am measuring high-resolution low-light response curves (Kok Method, see below) at three measurement temperature to construct a response curve of respiration in the light and close the knowlege gap on how carbon is cycled during the day. ﻿Measuring leaf respiration in the light directly is confounded by the simultaneous flux of CO2 into the leaf via photosynthesis. There are multiple methods to estimate respiration flux values in the light, including the Kok Method - a high-resolution light response curve that yields a "kink" or non-linearity point, usually below 100 umol of photosynthetically active raditation (PAR, see figure below). 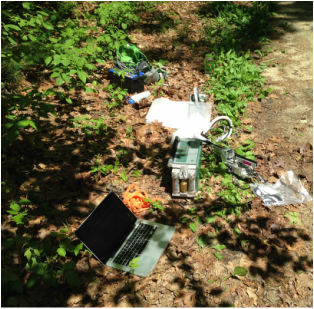 Starting in May 2015, I began field work to collect data on ecosystem carbon cycling during the day at Harvard Forest. It remains unknown the flux of carbon from the leaves of temperate forest species in the light, and how these fluxes are modified by leaf development and seasonal timing (phenology) and short-term changes in temperature and canopy position. The below diagram shows how carbon enters the ecosystem (leaf-level photosynthesis, expanded to the canopy), and how carbon leaves the ecosystem (respiration of various plant and non-plant (hetero-trophic) tissues and organisms (i.e. soil microbes). Automated chambers at Harvard Forest that monitor soil and stem respiration on multiple species will be combined with leaf level data to comprise a dataset of individual components that make up the daily and seasonal respiratory carbon budget. Collectively, these fluxes, when modeled by temperature and other environmental variables, can be scaled to the canopy-level to match and correct for estimates of Net Primary Productivity and Gross Primary Productivity of the forest system. Tcherkez G, Gauthier P, Buckley T, Busch F, Barbour MM, Bruhn D, Heskel MA, Gong XY, Crous KY, Griffin KL, Way DA, Turnbull MH, Adams M, Atkin OK, Farquhar GD, Cornic G. (2017) Leaf day respiration: low CO2 flux but high significance for metabolism and carbon balance. New Phytologist. Accepted. Heskel MA, OK Atkin, MH Turnbull, KL Griffin. (2013) Bringing the Kok effect to light: A review on the integration of daytime respiration and net ecosystem exchange. Ecosphere. 4 (8): art98.